some clean paper on part of the dining room. “[T]his was a fair day neither verry cold or warm,” recorded Old Oliver in his journal; he was beginning to look for rain for his crops, as the spring was turning dry. Evelina probably paid less attention to the weather than her father-in-law, because she was focused on the ritual spring cleaning. She hired extra help in the form of Mrs. Patterson, who may have been Mary Patterson, the forty-ish wife of Thomas Patterson, a farmer in Bridgewater. Whoever she was, Mrs. Patterson proved a boon to Evelina. The two women were busy all day cleaning, washing the floors, putting down carpet, and putting up new wallpaper. Evelina never changed out of her work dress, as would have been customary in the afternoon, and barely sat down. 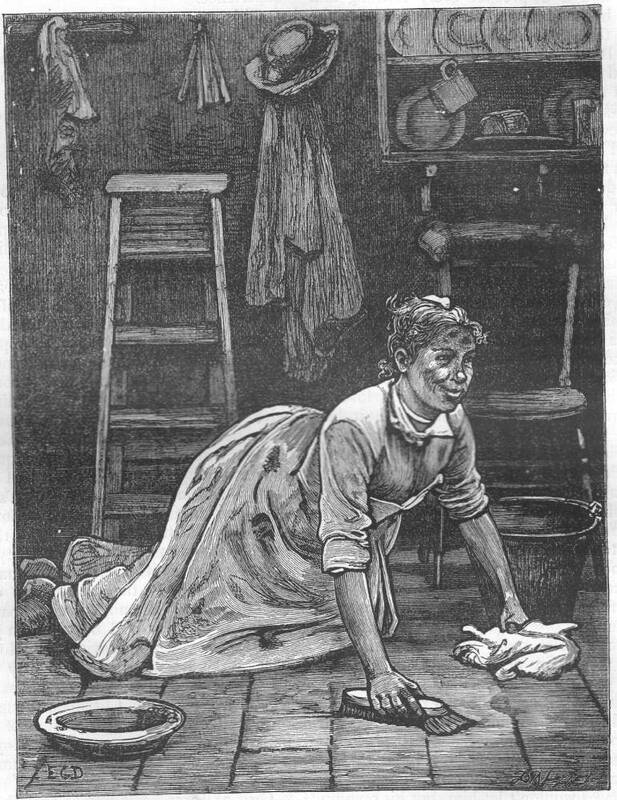 Meanwhile, the regular servant, Jane McHanna was preparing the meals and tending to the ordinary chores of the house. The trellis that Evelina and Oakes ordered from Lucius Clapp arrived today, and was most likely placed, free-standing, somewhere in the yard. It could well have been a centerpiece for Evelina’s flower garden. Oh my goodness … the first typo I’ve ever seen in your writing. Tellie – Trust me, it’s not my first typo. But thank you for catching it – I had to read it through three times before I saw the “Trellis”! Thanks for the heads-up.